The UK’s fifteen National Parks are each unique – some have high mountains others meandering wetlands and dramatic coastline. They offer infinite opportunities to explore, learn, relax, unwind, whether its a gentle family walk with little ones exploring every tree and flower along the way, action adventures to tempt teens away from their phones or cultural events exploring the special history of the National Parks. Find out about the wide range of events and activities here. All year round in the Cairnogrms Naitonal Park you can take part in organised events led by one of the ranger services operating in the Park or discover more about the Park’s rich cultural heritage by picking up a copy of the Gaelic Place Names or visit an attraction such as the Highland Folk Museum at Newtonmore. For wildlife experiences some of the best places to discover what lives here is at one of the many National Nature Reserves in and close to the Park such as Muir of Dinnet, Craigellachie and Abernethy. And maybe there are walking trails you have yet to discover and experience? Whether it’s on your own or maybe with one of the Park’s Health Walks groups, why not take a look at the community paths leaflets on the CNPA website for inspiration about where to go. 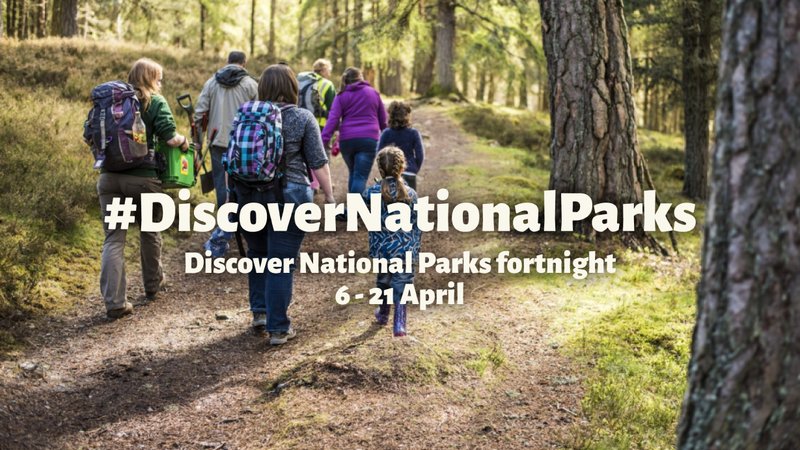 Volunteering is also another great way to discover the Cairngorms National Park and there are events running thoughout the year that people can sign up to. All 15 National Parks will be sharing to their social media channels all the incredible things you can discover and do in each of our Parks over the next fortnight – to keep up with all the posts from around the 15 Parks be sure to check out #DiscoverNationalParks on Facebook, Twitter, and Instagram. See what is happening over on our Facebook Page. Like to Twitter? Find us here. Or is Instagram more your style? Find us here. Alternatively follow @uknationalparks on Facebook, @uknationalparks on Twitter or @nationalparksuk on Instagram.